Hello! My name is Jishnu. I am a programmer based in Bangalore, India. I currently work at Taro as a full time remote employee. Previously, I was helping Hashcube to build social games. Want to know more about me? check out YourStory.com Techie Tuesdays Column. IndicKeyboard - Input method for android, supporting 23 languages. As seen on Deccan Chronicle, The Hindu, Times of India, Indian Express, The Economic Times, Deshabhimani and Medianama. SMS Attendance - Attendance notification system. AppRank.in - Website to tracks Google Play Store app rankings. Akshara Mazha - Android live wallpaper with Malayalam glyphs. Unical bot - Twitter bot which tweets university updates. Yet Another 2048 - A number based game. DevkitHelper - A set of helper libraries for GameClosure Devkit game engine. Malayalam Fonts WebExtension - Chrome & Firefox extension, Malayalam fonts for the entire web. Kerala JS 2017, Kochi - ES2015 and Beyond. Fossmeet 2017, NIT Calicut - Contributing to Indic Keyboard. MES College of Engineering 2016, Kuttippuram - CyanogenMod Source. Droidcon-in 2015, Bangalore - Android and Indian Languages. 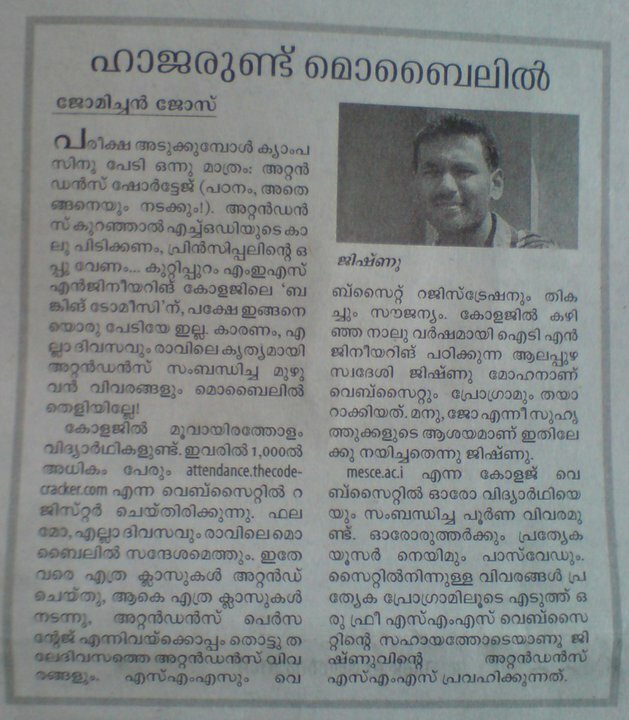 Swathanthra 2014, Thiruvananthapuram - CyanogenMod and AOSP. 12th Year SMC 2013, Thrissur - Indic languages on Mobile. Fossmeet 2013, NIT Calicut - Silpa Project. MES College of Engineering 2012, Kuttippuram - Introduction to Git. Fossmeet 2010, NIT Calicut - Introduction to Blender. Github, Gitlab, Twitter, Diaspora, Google+, Noun Project, Behance.